I’ve seen quite a few posts lately about ESXTOP not displaying properly. Long story short, esxtop does not display the interactive UI and displays the CSV output instead. 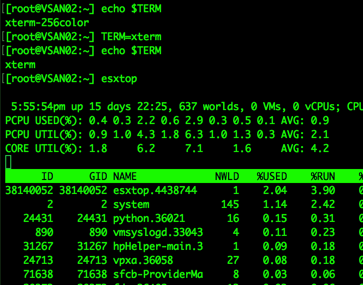 If your esxtop looks like this, then you need to change the terminal declaration to something like xterm. Notice here (red rectangle), how the terminal is set to xterm-256color. You can change the terminal declaration from the cli, but this is not persistent through sessions. To do this simply type “TERM=xterm“. This will display esxtop interface properly. If you want this change to persist, just change your favorite terminal settings to xterm from its current setting. For example, I use my Mac’s terminal to ssh into my lab, the terminal is set to xterm-256color, which causes the display issue. So, I just opened the terminal preferences and changed the declaration to xterm. By default, putty identifies itself as xterm(1), so no need to change that. 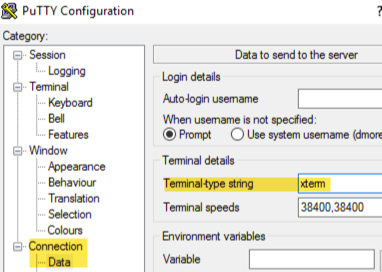 If putty is set to something else, then you can change the terminal-type string from the Connection>Data section.